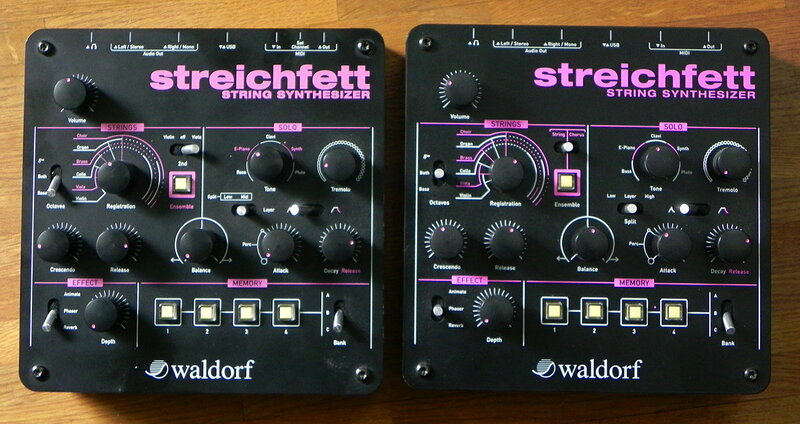 Waldorf introduced the Streichfett String Synthesizer in the size of the Waldorf Rocket in 2014. The news about it spread fast, as it was a big suprise to see a hardware version of a string machine being built in this century or millenium again. On the Musikmesse a few prototypes where shown (one is seen above on the left). They were slightly different in the lables and functions. And Waldorf changed the ensemble FX section for a better sound before releasing the production version (seen on the right). It was not Waldorf's goal to do a string machine to be able to recreate every well known string machine in all its sound details. But to built a flexible and programmable version with a wider range of sound characters then any other string machine I can think of. And all this for a price tag below you have to pay for a single vintage string machine on online auctions. And they did it very well! You can get the silky string sound of a Korg Lambda, the bass range of the Elka Rhapsody, the wide lush sound of a Logan String Melody well enough to be used on stage or in context. But of cause, the Streichfett is not a 100% copy soundwise of these. But way more flexible. The synthesizer section was added to get the often seen string and polysynth sound combinations of later seventies string machines. And it is not its intention to be s full super synth, but to recreat the typical timbres of the mostly preset synth sound you got in stringmachines 35 to 40 years ago. The Streichfett is working all digital inside. Even the Ensemble and Chorus FX is digital. It hasn't got an audio in to use the ensemble FX with external gear. Maybe Waldorf will built some super Ensemble FX like the Synthoma Élkorus or the Wersi Voice.